At the end of August every year, many cities’ movie theater labor contracts expired. Most expired annually, although longer agreements were made on occasion. The Film Daily called it the “annual labor row,” noting the preceding year’s unrest in Chicago, Washington, San Francisco and several other cities, and citing Kansas City, and Washington, and the Twin Cities as the year’s most likely hot zones.3 In both cities, the projectionists and stagehands were represented by the International Alliance for Theatrical Stage Employees and Motion Picture Projectionists (IATSE), while the musicians were part of the American Federation of Musicians. The controversy existing at present between the stage employees of this city and St. Paul, and the managerial association of both cities involves the question of one day’s rest in seven. The stage employees are entering upon the fourth day of their strike in protest against the seven-day week. They wish to submit to the public the true conditions which exist at the present time. 1“City Moves to End Minneapolis Strike,” The Film Daily, October 20, 1927. 2Charles Rumford Walker, American City: A Rank and File History of Minneapolis (Minneapolis, MN: University of Minnesota Press, 1937), xviii; William Millikan, A Union Against Unions: The Minneapolis Citizens Alliance and Its Fight Against Organized Labor, 1903–1947 (Saint Paul, MN: Minnesota Historical Society Press, 2001). 3“Early Rumblings in Annual Labor Row,” The Film Daily, July 8, 1927. 4“Industrial Disputes: Strikes and Lockouts in the United States in August, 1927,” Monthly Labor Review, October 1927; “Industrial Disputes: Strikes and Lockouts in the United States in September, 1927,” Monthly Labor Review, November 1927; “Theaters Find It Costly to Break Union Agreement,” Duluth Labor World, October 1, 1927. 5“N. W. Unit Merging,” The Film Daily, June 5, 1927; “Northwest M.P.T.O. Meet,” Motion Picture News, May 20, 1927. 6“14-Hour Day Not Unusual Theatre Workers Assert,” Minneapolis Labor Review, September 23, 1927; “Movie Theater Heads to Form Single Body,” Saint Paul Pioneer Press, May 3, 1927. 7“No’west T. O. to Present Requests to Labor,” Motion Picture News, July 1, 1927. 8“Labor Cuts Demanded,” Motion Picture News, July 29, 1927; “Labor Troubles Threaten,” Motion Picture News, August 26, 1927. 9“Theater Strike as in Chicago Feared Here,” Saint Paul Dispatch, August 31, 1927; “Movie Machine Operators Do Not Foresee Trouble,” Saint Paul Pioneer Press, September 1, 1927; “Theatre Strike Halted,” Motion Picture News, September 23, 1927; “St. Paul Theater Closed to Halt Musicians Row,” Saint Paul Dispatch, September 1, 1927; “Wage Increase Given Mill City Movie Operators,” Saint Paul Pioneer Press, September 2, 1927. 10“Movie Operators Demand Pay Rise,” Minneapolis Journal, August 30, 1927; “Picture Operators Get Wage Increase; Sign One-Year Pact,” Minneapolis Labor Review, September 9, 1927; “Musicians’ Union, Show Managers Sign Working Agreement,” Minneapolis Labor Review, September 9, 1927. Throughout this site, 2014 inflation-adjusted numbers have been calculated using the Bureau of Labor Statistics’ online CPI Inflation Calculator. 11“Twin City Theatrical Employees Forced Out,” Minnesota Union Advocate, September 22, 1927; “Stagehands of Ten Twin City Theaters Strike,” Minneapolis Journal, September 18, 1927; “Sympathy Theater Strike Held Likely,” Saint Paul Dispatch, September 20, 1927; “Stage Employees Ask One Day Off During Week; Operators Out,” Minneapolis Labor Review, September 23, 1927. 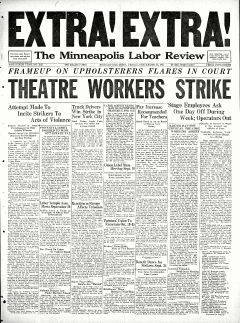 12“Strike of Theater Workers Is 100 Per Cent,” Minnesota Union Advocate, September 29, 1927. 13“Stagehands of Ten Twin City Theaters Strike”; “Exhibitors Confident in Twin City Strike,” The Film Daily, October 3, 1927. 14“Stagehands of Ten Twin City Theaters Strike,” Minneapolis Journal, September 18, 1927. 15“14-Hour Day Not Unusual Theatre Workers Assert,” Minneapolis Labor Review, September 23, 1927. 16Accounts differ on the exact number, but it is either four or five. 17“Stage Employees Ask One Day Off During Week; Operators Out,” Minneapolis Labor Review, September 23, 1927; “Picture Operators Join Stage Strike,” Saint Paul Pioneer Press, September 21, 1927; “Panic Narrowly Prevented When Film Blaze Starts in Theatre; Daily Newspapers Suppress Facts,” Minneapolis Labor Review, September 27, 1927. 19“Twin City Theatrical Employees Forced Out,” Minnesota Union Advocate, September 22, 1927; “Musicians to Join Stage Hand Strike,” Saint Paul Dispatch, September 21, 1927; “Musicians Ready to Quit Theaters,” Minneapolis Journal, September 24, 1927. 22“‘Road Call’ Hits Theatres,” Minneapolis Labor Review, October 7, 1927. 23“Musicians to Join Theater Strikers,” Saint Paul Pioneer Press, September 23, 1927; “Musicians Walk Out of Theaters on Eastern Call,” Saint Paul Pioneer Press, September 25, 1927. 26“Theater Men Give Version of Row,” Saint Paul Pioneer Press, September 22, 1927; Robert Schulz, “More Than Wages: Twin Cities Theater Workers’ Control Struggles,” Minnesota History 53, no. 8 (Winter 1993): 329. 27“Theater Managers Try the Citizens’ Alliance Advertising Scheme,” Minnesota Union Advocate, September 22, 1927; “Incompetent Movie Men Cause Theater Fires in Twin Cities,” Minnesota Union Advocate, September 29, 1927. 28William Millikan, A Union Against Unions: The Minneapolis Citizens Alliance and Its Fight Against Organized Labor, 1903–1947, Saint Paul, MN: Minnesota Historical Society Press, 2001, 206–207.